Michael Gettel stands the stereotypes of new age music on their head. His instrumental music  both solo piano and ensemble  is melodic, haunting and memorable. He writes tunes that stick in your head like a good pop song, arrangements that challenge. His latest album is a collection of songs devoted to winter  not necessarily holiday music, but seasonal and appropriate. Some are new and others are taken from his earlier Narada releases; all tied together by theme. 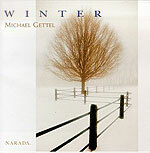 Gettel's compositions (and performances) capture the crispness of winter, that sharpness of cold air tempered and low, scuttling grayness that nevertheless make you feel more alive than any springtime explosion of color and warmth. The man has an obvious appreciation for the delights of winter and does a nice job of translating them into music. If you're at all a fan of the winter months, you'll also appreciate the booklets landscape photos by David Lorenz Winston  a tasteful complement to Gettel's music.